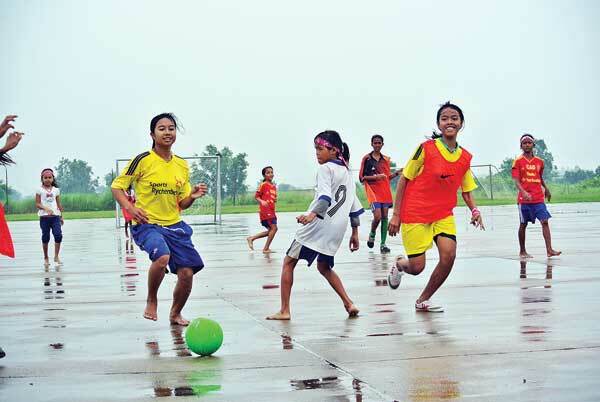 Seasonal rains did little to deter about one hundred girls from playing football in Battambang on Sunday. In celebration of the International Day of the Girl Child this Thursday, local sports and leadership training organisation SALT Academy organised a football festival for all the girls that participate in their league competition. The event was held in co-operation with the Garden of Hope Foundation and their 2012 Asia Girl Campaign. Girls of different ages and backgrounds got together for a series of five-a-side friendlies on the Battambang Airfield. It was a great moment to meet peers from other neighbourhoods and make new friends. The Mighty Girls, a team of talented young players within SALT’s programmes, acted as mentors and coaches for the participants and also helped co-organise the festival. The girls learned important life skills during the day, and in small groups talked about their human rights and about their own futures and careers. “The girls need to know about their rights in order to protect themselves now and in the future,” said 14-year-old Keourm Kanha, one of the volunteers from the Mighty Girls. “In Cambodia, every child has the right to education and participation, among other [things],” she said. Kanha is set for further work on promoting girls’ rights in the region, and will travel today to a conference in Taipei, Taiwan, that brings together outstanding young women from all over Asia for a week of cultural exchange and dialogue. Kanha will represent Cambodia in the conference that is organised by the Garden of Hope Foundation. For further information visit the Asia Girls Campaign on Facebook.